Stay organized from year to year. A full page for every month for three full years! Have used before and still using. This one is for my son who started using it three years ago at my suggestion. Very good for use as a planner and since covers 3 or 5 years is good reference point to past notes. Very well made and allows for multiple entries in each date square. These calendar Diaries are awesome! I use these everyday, they're great because they hold three years of information. As a library director, I record lots of information: shows, attendees, costs, meetings, more meetings, even more meetings (did I mention meetings?) and other special events. The squares are not ginormous, but they are big enough. I am fortunate the previous Director used these, as it gives a record to look back upon. I will buy this product every 3 years! The most recent purchase of this calendar will take us through 12 years of organizing and providing a quick historical reference of important dates. I was in a bit of a quandary when it appeared that I either needed to buy one that overlapped a calendar year of one already in use or skip a year, but customer service quickly steered me in the right direction. As a "cheese head" by birth, I would expect nothing less from the good people of Wisconsin! I have been buying these calendars for years. It is great being able to have 3 years in one calendar & to plan ahead and also as a reference to what happened on certain days of years past. i buy these every three years and have done so for years. everyday calendar on the kitchen wall. Another calendar for my 15year plus collection! My multi year calendar sits by my phone, always handy for filling out my appointments and other pertinent information I want to keep. It's a great way to keep track of birthdays, anniversaries, and other special dates too. Because it includes several years it becomes an easy way to look up past events, too. I would not want to be without it! My mom used these thruout the years, now that she's gone I appreciate the diary it kept. I decided to start the same tradition this year. Paper could be a bit heavier. I've bought one of these from Miles Kimball for several years now as they provide a one stop payment "shop" for all our monthly bills, most of which I pay online. I include all the usual bills due plus the periodic insurance, taxes, and annual automatic payments. If I know that life will be extra busy during one part of the month, I pay the bills early. If I'm out of town, then my husband knows where to look for What's Due. I also note on a sheet (one for each month) what I spend under a list of categories. The tips in the book are helpful, too. This year I bought an extra book for a young 21 year old friend after showing him mine. I keep all of my appointments on this calendar! Even though I have them on my phone I still want to be able to see my day, week or month at a glance and I find this calendar does the trick. Wouldn't be without it. Both my husband and I have one. I use this as my monthly bill organizer. It has nice quality pages that have lasted through moving, minor spills, and the occasional temper tantrum (haven't we all had one of those paying the bills...lol). The covers are very sturdy and have only the tiniest curl at the corners after three years of hard use. I have been using this calendar since 1984. It is great. Perfect for putting appointments in ahead of time. I buy one of these 3 year calendar every 3 years. I started using the 2 or 3 year calendar in Mid 2005, maybe sooner. At that time I just started my 1st round of cancer treatments. For some reason I did not reorder after I retired from work June 2009. Then my 2nd round of my cancer returned in 2011, and now my 3rd round of cancer returned 2017. Sorry to say but without your calendar I have not been very organized. I will always order these calendars. I really like the format of your calendar. Matter of fact, I still have the one from Mid 2005 with all my cancer appt, notes & other vital information. It is very attractive and very user friendly. Easy to travel with and to write important info & appt. The weight of the calendar paper is very good & sturdy. The prices for this calendar is not bad. I am very happy with your calendar. I have used these calendars for several years now. I have talked family and friends to use them. They are very much pleased with them. This calendar is very useful to keep track of Dr. appointments, medications, birthdays, anniversaries, etc. I can look back at prior years to see what went on. We love this calendar. It is the one place we go to if we need to put down dates or if we need to know what activities are coming up. We keep it out on the counter so we can refer to it often. We don't have to turn on our computer and scroll through it to get information. Our son has a smartphone but his family uses this calendar too to keep track of events and activities. Also I like that we can look a head a year to see what day of the week a date comes on. Thank you for such an innovative item. 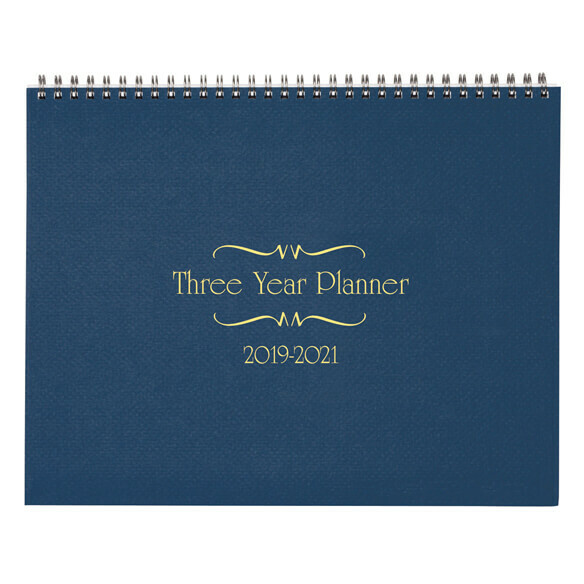 It is so convenient having three years at your fingertips to schedule ahead. The pages are easy to read, plenty of space in the date squares to write, and the white page above (the back of the previous month) is perfect for making notes of things you don't want to forget. There is space in the back for important phone numbers. I will keep buying these calendars. It helps with memory and where I was when hubby says how did we get a bill from here? I like it, but I wish I could hang it on the wall. Didn't realize it was a desk/table model.